It has been a crazy few days in the Baum household. It appears that these will be the first of many crazy days to come! Our story starts around a year ago, when we decided that we were ready to buy a house. The deal between the two of us had always been that if we were ready to buy a house, we’d be ready to start a family not long after. Actually, I guess if we’re being honest, it was a direct result of the fact that my insurance coverage changed and my birth control was now going to cost us over $100/month. No thank you. I was lusting at the thought of the multitude new clothes and shoes and perhaps some decorations for the new house we didn’t yet have with that roughly $1,000 we’d be saving by me not taking the pill. So here we were – not really “trying” per se, but not really “not trying,” either (or, as Dan says, “we pulled the goalie”). We were in agreement that January 2011 would be when the real “trying” would commence. In hindsight, it was probably not the best month in the whole world to begin trying to start a family. January is the beginning of one of the busiest times of the year for accountants, and on top of it I (Sarah) was traveling for the first two months of the year (For any male who may be reading this – that’s you, Dad! - I’m about to get pretty detailed. Consider yourself warned.). In addition to the problem of being in the same city, after I went off the pill I realized that having been on it for 13 years meant that my cycle was REALLY irregular. I’m talking 90 days between periods one time, 50 the next, a roughly normal 30 and then another 90. This made it really hard to plan. I should probably also confess here that although we weren’t going to start “trying” until January, because of the irregularity of my cycle, I took a LOT of pregnancy tests that were negative. 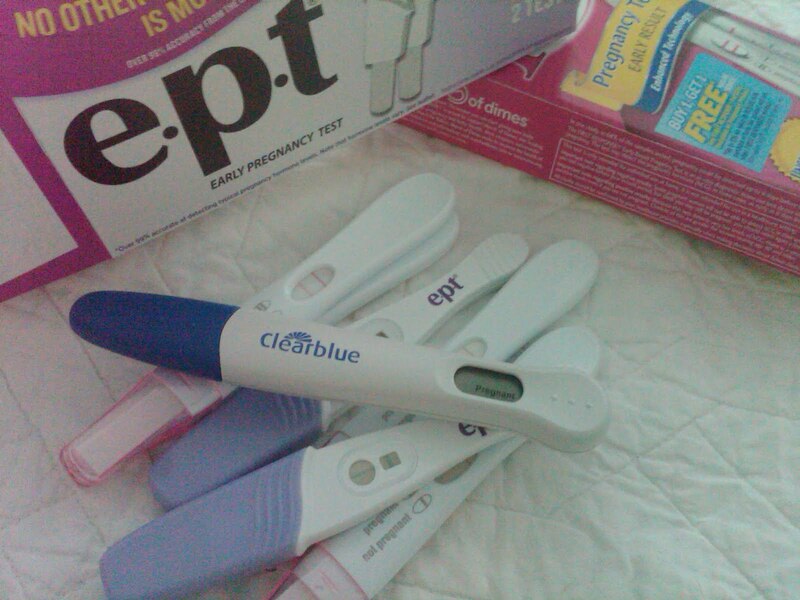 Every month when I was late and got a negative test, I was disappointed, even though I tried not to be. We were in agreement that we were not going to tell anyone that we’d decided to start a family (Enter my Mother, who in January told me that when someone at Sunday school asked her what she was looking forward to in 2011, she answered “grandbabies.” Also enter my mother-in-law, who has been predicting for months that we would have a baby in 2011. Subtlety is not your strong suit, ladies!). We didn’t want to put a lot of pressure on ourselves in case something went wrong or we had any problems. Fast forward several months to the May/June time frame. Although my cycles were still very irregular, I had gotten a little better at determining when my monthly visitor should come. So imagine my delight when I realized that I was a few days late. I wasn’t sure of the EXACT date I was supposed to get it, but I thought it would be on or around Monday. Monday came and went with no sign of it, and by mid afternoon Tuesday I was trying to talk myself out of rejoicing just in case I had mis-calculated. I told myself I was going to wait until Friday before taking a test, just to be sure. In the mean time, I was dreaming up cool ways in my head to tell Dan the good news. We spent the weekend in Charlotte with my family to celebrate my grandparents’ 60th wedding anniversary, and boy was it hard to keep the secret from them! My Mom has flat out asked me if I stopped taking my birth control, and I’ve continued to tell her no and we weren’t ready (sorry, Mom!). Katy asked me flat out over the weekend if I was pregnant, because she noticed that I hadn’t been drinking and that I wasn’t feeling well on Saturday night (side note: what does it say about me that the second I’m without a glass of wine people get suspicious?). It remains to be seen whether she believed it – I’m a terrible liar. We are so overwhelmed but so excited for this next chapter in our lives. We both feel like we have a lot of research to do! We absolutely cannot wait to share our big news with our families. Dan has started calling the baby “Herschel” or, more recently, “Geronimo” (I try not to even ask, he is ridiculous – tells me he has more imagination than Willy Wonka!) and insists that it will be a boy. When I asked him what he would do if the baby is a girl, he informed me that he didn’t send any girl swimmers. He also just figured out that he’ll have a designated driver during all of football season, so needless to say he’s pretty ecstatic. That’s all for today – we kicked off the blog with a pretty lengthy entry I guess! More updates to come over the next few weeks. We so excited about this journey and for the debut of Baby Baum in February 2012 (we think). Until next time! *No, I did not blog six times in one day. The first several blog posts were written in a Word Document until we could decide/agree on a blog name; I put the "written on" date for informational purposes, because I'm quite positive that everyone is as OCD as me. HOORAY for Baby B! :) Cannot wait for his (or her...sorry Dan) arrival. Baby A and Baby B 6.5 weeks apart...what are our husbands going to do with us?! ;) Ahhh, just absolutely cannot freaking wait.